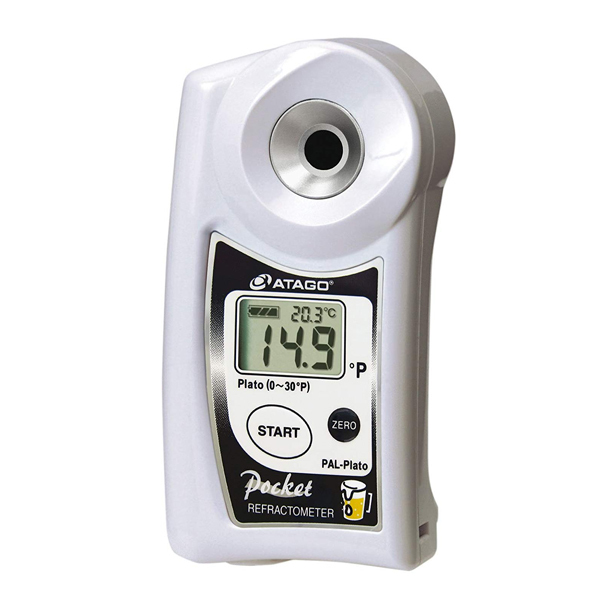 PAL-Plato / ATAGO Digital Hand-held"Pocket" Wort plato Refractometer Measurement Range : Plato : 0.0 to 30.0ﾟP, Temperature : 10 to 75ﾟC.International Protection Class : IP65 Dust-tight and Protected against water jets. International Protection Class : IP65 Dust-tight and Protected against water jets. Advantages of the PAL-Plato include : Two buttons for easy operation, an LCD screen for objective readings, and Automatic Temperature Compensation up to 75ºC (212ºF)! Additionally, taking measurements with the PAL-Plato only requires a few drops of sample, and it provides accurate readings within 3 seconds!